The Policy & Planning Division of the Ministry of Economic Affairs act as a direct professional link between the Ministry and the Gross National Happiness Commission Secretariat on matters pertaining to planning and budgetary processes. Besides, the Policy & Planning Division facilitates and coordinates inter departmental initiatives and programs. The Division assists in formulation of policies and five year plans of the line departments and facilitates with the central planning body of the government on budgetary matters and any other issues related to the implementation of the planned targets including submission of progress reports. Therefore, the strategy of the division is already inline with the vision, mission and mandate of the ministry. Planning Section: The Planning Section of the Division assists the departments on formulation of five year plans and programs. The Section coordinates and facilitates the departments in issues related to timely mobilization of funds for implementation of the planned activities. It acts as the interface between the Ministry and the central planning body of the Government. 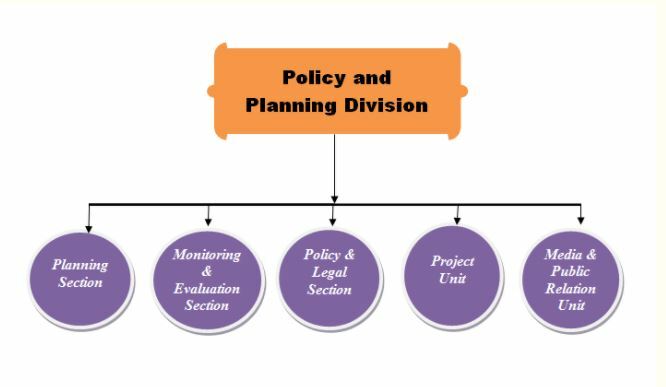 Monitoring & Evaluation Section: This section is responsible for monitoring and evaluation of the planned targets, highlight issues related to implementation of the plans and programs and monitoring timely update of progress in the planning and monitoring system. Policy & Legal Section: The section is responsible for formulation of policies, guiding the departments in following the policy protocols, screening of policies and coordinating with the Gross National Happiness Commission Secretariat. Litigation and legal advisory services are also provided by this section. Project Unit: The Project Unit is responsible for coordinating with donor agencies and international experts on implementation of priority initiatives of the government such as in the areas of improving the investment climate. Currently, the Project Unit liaises with the World Bank Group/International Finance Cooperation and Asian Development Bank on initiatives such as Improving the Ease of Doing Business of Bhutan, formulation of Public Private Partnership Policy, Institutional set up of the Better Business Council among others. Media & Public Relation Unit: The Chief Planning Officer is the media focal officer of the Ministry. The unit is responsible for providing any official information to the media and public. The Media & Public Relation Unit follows a set guideline for this purpose to ensure up-to-date and reliable information is provided to the media and public. To promote a green and self reliant economy sustained by an IT enabled knowledge society guided by the philosophy of GNH. To create an enabling environment, including institutions and infrastructure for the sustainable growth of the economy through public and private sector development.